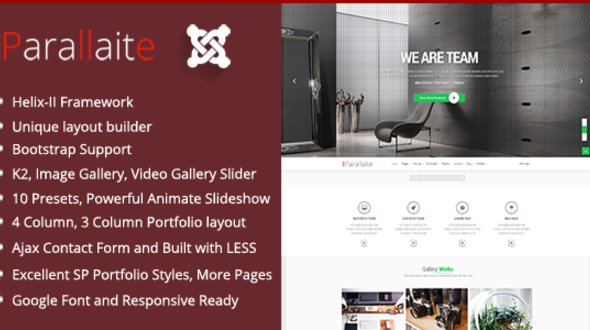 Parallaite – is clean Multipurpose Joomla Template. It is great, professional, clean and modern Joomla 3.x template and easy to use template. You can use it for, business, Photo Studio, Freelancers, Portfolio Theme, Creative Agency, Corporate Websites etc. It is fully responsive and offers unlimited color variations, Google Fonts and more features. It is built on the well-known Helix Framework. It comes with 8 preset variations. Parallaite is a really beautiful, pixel-perfect template that can showcase your projects, blog post and images in amazing way! Layout Builder Theme customization has no boundaries! The powerful Layout Builder in Helix makes it super easy to customize your layout without having to use any programming language. Unlimited Module Positions Now anyone can change the Module Positions to anywhere they want. There are no limitations in creating the new modules & positioning.